It was Tax Day, and I was finishing up the MarketWatch Index calculations for the 2008 freshman sires. I re-sorted the spreadsheet so the sires would rank from highest to lowest by their MWIs, expecting to see Tapit rise to the top. But he didn't. Tapit was second to Stroll, the grade I-winning son of Pulpit who was bred and raced by Claiborne Farm. Stroll is not only the leading freshman sire, he is the leading sire by a pretty wide margin. 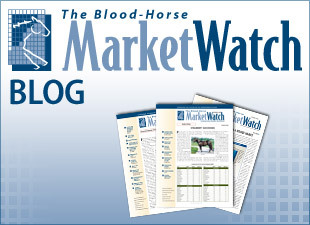 Stroll has an MWI of 5.02, which is the second-highest index calculated for a freshman sire since The Blood-Horse MarketWatch began publishing the MWI in its current format in 2005. The highest index belongs to Successful Appeal, who had a 5.85 as a freshman sire of 2004. Tapit has an MWI of 3.65, which is still very strong. What put Stroll on top was his 8% stakes winners (of at least $50,000) from foals and his 3% graded stakes winners from foals. How about that, I think. The top freshmen by the MWI are both sons of Pulpit. Then I do a little research on Stroll and discover he is not standing at Claiborne anymore. He was relocated for the 2008 season to Azienda Agricola Mediterranea in Parma, Italy, where he stands for 12,000 euros. While at Claiborne, Stroll's fee started at $7,500 and dropped to $5,000 for 2007. Stroll didn't make it into our final list of leading freshman sires because he is no longer standing in North America, but it didn't take long to get reminded about why he is at the top of the list. On April 16 at Keeneland, a daughter of Stroll named Afternoon Stroll captured the grade III Applachian Stakes. It was her first start on the turf, and she went off at 50-1. Afternoon Stroll became her sire's second graded stakes winner. The first was Van Lear Rose, who won the Mazarine Stakes (gr. III) at Woodbine and was Canadian's champion 2-year-old filly for 2008. So why did Stroll leave? Well, his first obstacle as a sire in the United States was that he won all his best races on the turf. Stroll did well as a 2-year-old, finishing in the money three times out of five starts, but all his best performances, again, were on the grass. Next, Pulpit's star as a sire of sires was yet to rise. The result was 58 mares bred to Stroll in 2005, 25 mares in 2006, and 11 mares in 2007.